The devastation that Hurricane Harvey wreaked is still being addressed by government agencies, insurance companies and families whose lives will never be the same. While people are picking up the pieces of their lives, there's another weather front ramping up this time east of the Cape Verde islands. There's another storm in the far eastern Atlantic Ocean that has been upgraded from a low pressure area to tropical storm Irma on August 30, 2017 at 11:00 AM AST (1500 UTC). Tropical cyclones that form in that part of the Atlantic Ocean are often the largest and most powerful hurricanes of the season. Hurricanes Ivan (2004), Isabel (2003), Hugo (1989) and Allen (1980) are examples of past powerful hurricanes that formed near the Cape Verde islands. The GPM core observatory satellite flew above forming tropical storm Irma on August 30, 2017 at 1:56 AM EDT (0556 UTC). 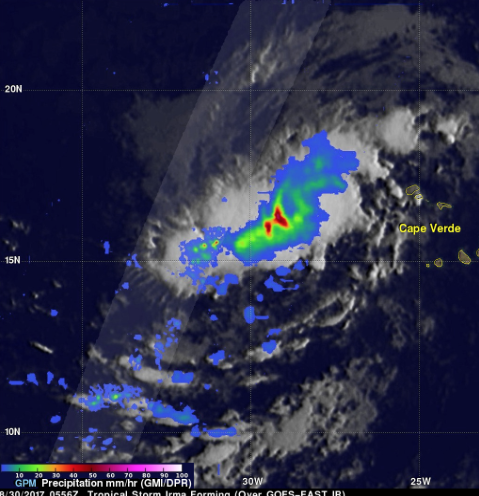 This new tropical cyclone was forming from a tropical wave that was passing to the east of the Cape Verde islands. Scans by GPM's Microwave Imager (GMI) and Dual-Frequency Precipitation Radar (DPR) instruments (shown in lighter shades) revealed that heavy rain was falling in this area of strong convective storms. Rain falling at a rate of over 2.6 inches (66 mm) per hour was indicated by GPM's GMI. DPR scanned storms to the west of the center of circulation and found rain dropping at at rate of over 4.96 inches (126 mm) per hour. GPM's radar (DPR Ku band) showed that heights of convective storm tops located to the west of the forming tropical storm were reaching altitudes above 8.2 miles (13.2 km). The National Hurricane Center (NHC) indicates that Irma is moving toward the west-northwest. Tropical storm Irma is predicted to become more powerful and be a hurricane in a couple days. Irma is then expected to stay at low latitudes next week while approaching the Lesser Antilles. After forming in the eastern Atlantic Ocean on Wednesday tropical storm Irma strengthened and became a powerful category three hurricane on Thursday August 31, 2017. 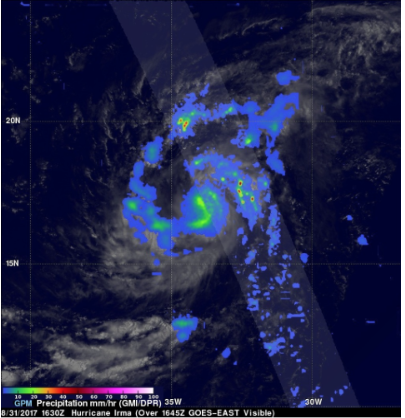 Hurricane Irma was moving west-northwestward with winds of about 115 mph (100 kts) when the GPM core Observatory satellite saw it on September 1, 2017 at 1:47 AM AST (0547 UTC). Data collected by GPM's Microwave Imager (GMI) and Dual-Frequency Precipitation Radar (DPR) instruments showed the locations and intensity of heavy precipitation within the hurricane. GPM's Radar (DPR Ku band) found that a powerful convective storm in a band of rain on Irma's northern side was dropping rain at a rate of almost 6.3 inches (159 mm) per hour. GPM's radar (DPR Ku Band) showed the height and the 3-D rainfall structure of powerful storms spiraling around hurricane Irma. DPR showed that storm tops were reaching heights of over 9.6 miles (15.5 km) in the band of powerful convective storms north of the hurricane's center. The National Hurricane Center (NHC) predicts that hurricane Irma will slowly intensify while heading toward the west-northwest. Irma is predicted to have winds of over 123 mph (110 kts) within the next five days. There is some uncertainty about the long term direction of Irma's movement. The strength of the Atlantic sub-tropical high is one factor that can influence whether the hurricane moves on a low latitude track toward the Bahamas or heads toward the east coast of the United States.